So you’re wondering what to teach…? Are you worried about teaching? Have you never taught before? Are you comfortable with older children but not with younger children? Are you worried that VESL, or the pupils, or the school teachers will think that you are not being useful? Do you not have any idea WHAT or HOW you should teach them? Are you excited and desperate to get and to give as much during the project as possible? Well, NEVER FEAR – By the end of this blog, with any luck you will not feel quite as worried as before. If you are out there and you have nodded your head to at least one question, then that’s great!. If you are not nodding your head, then you would be the first volunteer I have ever come across with a still head when I have asked those questions. Also, thank you for nodding your head because if you have questions, or you’re nervous then it means you care and you’re going for the right reasons which is exactly the kind of volunteer VESL wants. There are some key lessons that I have learned during my time with VESL, from VESL consultant (Kath McGuire), from the VESL training in the UK and just through being out here as well. As much as you prepare for the experience in the UK, actually being here is completely different and will be a shock to the system. So, I hope when you all get out there you remember these tips when you have moments of doubt, which of course happen to us all. 1. You are NOT there as a professional teacher. 2. You are NOT there to be the best teacher in the World. 3. You are NOT there to have the kids reading Shakespeare in six weeks. 1. You are a native speaker of the English language, and so every pupil, host family and teacher will gain exposure to this through hearing you use the language and hopefully gaining the confidence to use it when speaking to you and each other. Learning English from a Thai, Indian, or Sri Lankan teacher is a world away from actually putting it to use with native English speakers. The effect of this will last for years after your departure. 2. Playing games and songs can be as useful as any other kind of teaching. It is likely that the way the students have learned English without you is not very interactive, so the more fun you can have with them the better. Hopefully, this will rub off on the English teachers at the school, and they will be inspired to teach English in a more creative way after you leave. 3. Speak to the teachers, this will give them more confidence with the language and that is hugely beneficial because this will be visible to the pupils and they will gain in confidence as well. 4. You can NEVER run out of ideas for teaching. You could spend six weeks on colours and shapes and make it work. The more you go over the topic, the better they will understand. 5. YOU WILL GET BORED OF TEACHING A TOPIC BEFORE THEY DO. 6. You can never speak too slowly, it’s not patronising, speak loudly and clearly. 7. Try not to focus on grammar very often if possible. They are probably doing lots of reading and writing in their lessons any way. 8. The more you can get the pupils to actually SPEAK to you the better. There are sounds in the English vocabulary that they will not have. R’s and L’s for example can be tough for Thai people to use and this will take time. They will have to train their muscles to use those sounds. 9. Relax, if something goes wrong then it’s okay. Never be afraid of giving up on your lesson plan and turning to the safety of a song, or hangman or anything like this. Some times lessons just don’t quite work and that’s absolutely fine. 10. You DON’T have to do anything you don’t feel totally comfortable with. If you are teaching too many hours, or not enough, speak to your student coordinator or in country manager. They are there to help you so don’t be afraid to bring up any issues however small you might think they are. Every one will do everything they can to make sure you are comfortable. 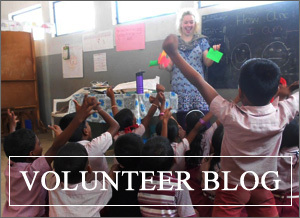 A happy volunteer is an effective volunteer. 11. Famous Kath Mcguire quote, “A smile will help to solve almost any problem”. 12. If you find that you have spare time and you want to do more. Organise after school clubs, take on more lessons, give the teachers lessons, run dance or sports classes. The opportunities are endless – the harder you work the more every one involved will get out of the experience.